To the untrained eye, KnitWit Yarn Shop looks like just another storefront on a sleepy street in Portland, Maine. But for those in the know, it’s a treasure trove of color, texture and enthusiasm for a craft passed down through generations. KnitWit is owned by Suzie vonReyn, knitter enthusiast. 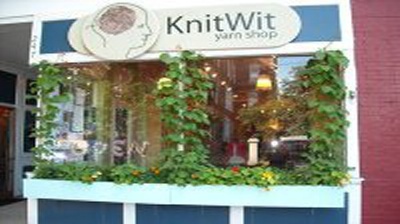 KnitWit is a cozy shop with a welcoming hand knit sign to greet you. Discovered by Suzie on one of her travel adventures in Maine, she purchased the store from the previous owner in 2011 and is now living her dream. KnitWit is the flagship store for the new Quince & Co. yarns featuring 37 luscious colors of bulky Puffin, chunky Osprey, worsted Lark, and lightweight Chickadee. 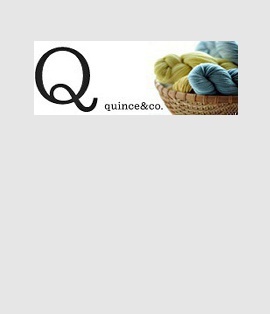 Quince yarns are made primarily from US-grown wool and are spun in Biddeford, Maine, just 20 minutes south of Portland. They come with their own line of simple yet sophisticated patterns. KnitWit focuses on carrying products produced in the U.S.A., especially Quince & Co. yarns, grown and produced right in Maine. Building on that foundation, Suzie also supports local pattern artists as well as domestically made knitting notions, needles and accessories. The unique product lines carried at KnitWit as well as the warm, inviting atmosphere keep the shop busy throughout the year. Customers are welcome to come in and knit, bring problem projects, have a cup of coffee and just relax. Suzie brings attention to her art through local classes and media interviews, including Suzie vonRreyn's interview in Portland, Maine. 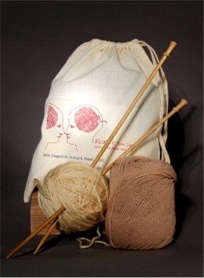 Suzie found perfect drawstring bags to use as project bag on our website. She uses two sizes of 100% Organic Cotton Drawstring bags, 10" x 12" and 12" x 16". The face of the bag is printed with KnitWit’s multi-colored logo, which makes the bags an ideal marketing tool. These bags can hold projects and help keep customers organized. They have become so popular that they can be seen all over the United States! If you’re in the Portland area, stop by KnitWit Yarn Shop and learn a new stitch, exchange travel stories with Suzie, buy some Quince & Co. yarn and have the whole package put into a beautiful project bag. You’ll walk out feeling good about the time spent in the shop and the purchases you’ve made!